11:40 Gustaf Leijonhufvud -- What’s behind the façade? 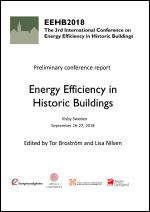 14:50 Giovanna Franco -- Nearly Zero Energy Heritage: taboo or challenge? By: Hao, L., Lavagna, M., Troi, A., & Herrera, D.
The XII Italian LCA Network Conference. Life Cycle Thinking in decision-making for sustainability: from public policies to private businesses, 11-12 June 2018, Messina, Italy.